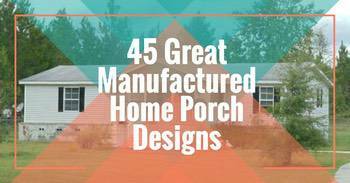 These awesome RV deck design ideas are perfect for any make or model! 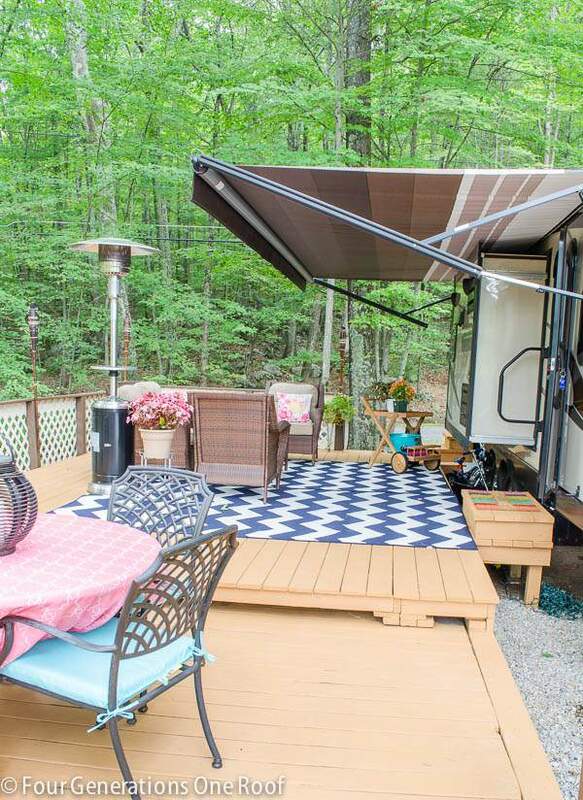 From traditional arts and crafts style to sleek and modern, you’ll find an RV deck design that suits you and your needs. You’ll also learn how to build a floating RV deck quickly and easily. 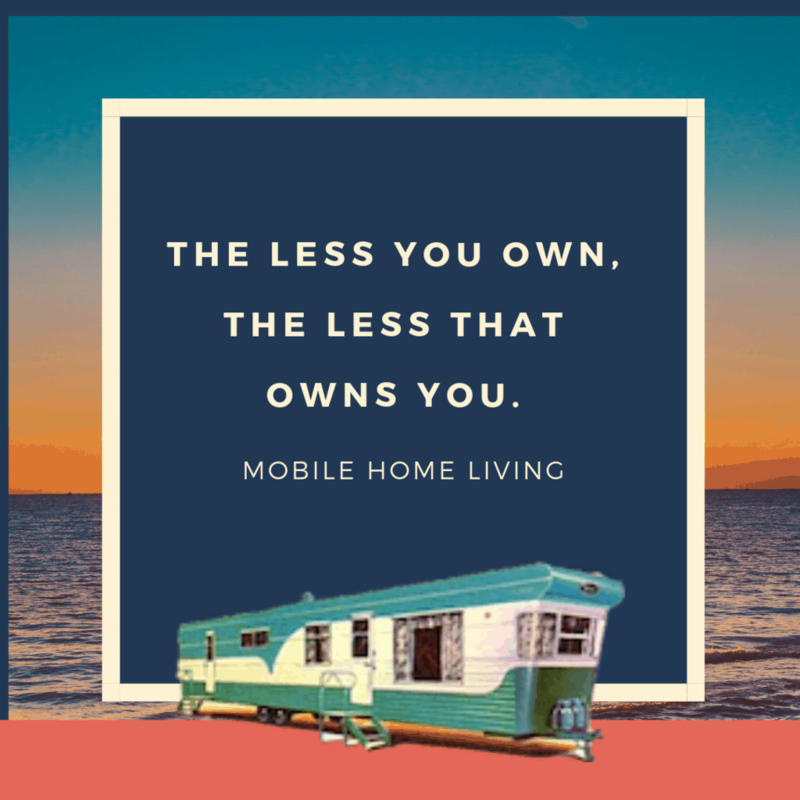 RV’s are a smart choice for both full-time living and temporary travel. 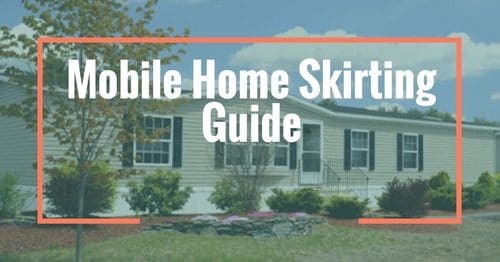 They can be used in a multitude of ways; as an affordable tiny home, a vacation or weekend cabin, or as a traveling home on wheels. 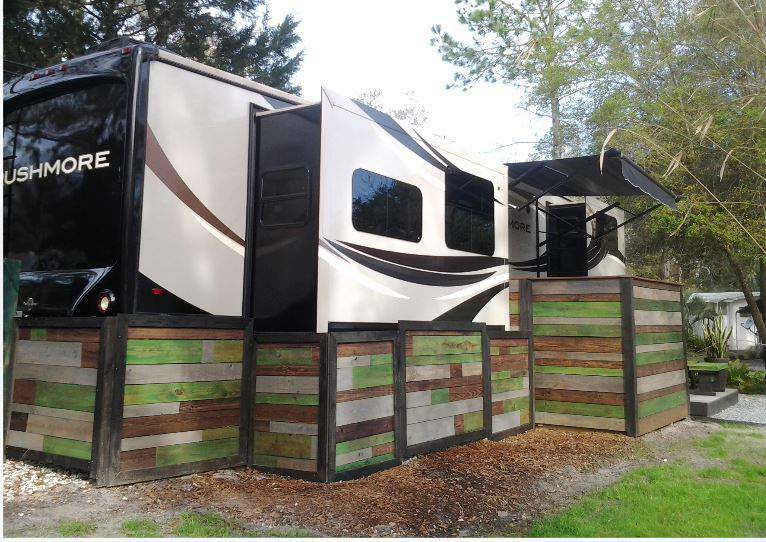 These awesome RV deck designs can help keep your camper clean, create an attractive outdoor living space, and increase the overall enjoyment of your RV. Our first RV deck design was submitted to us by Richard Quick. 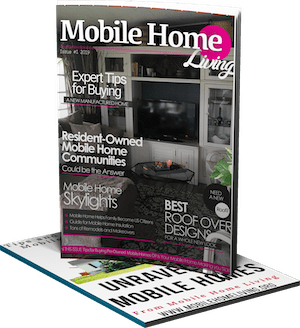 He allowed us to feature his gorgeous Florida manufactured home last year. 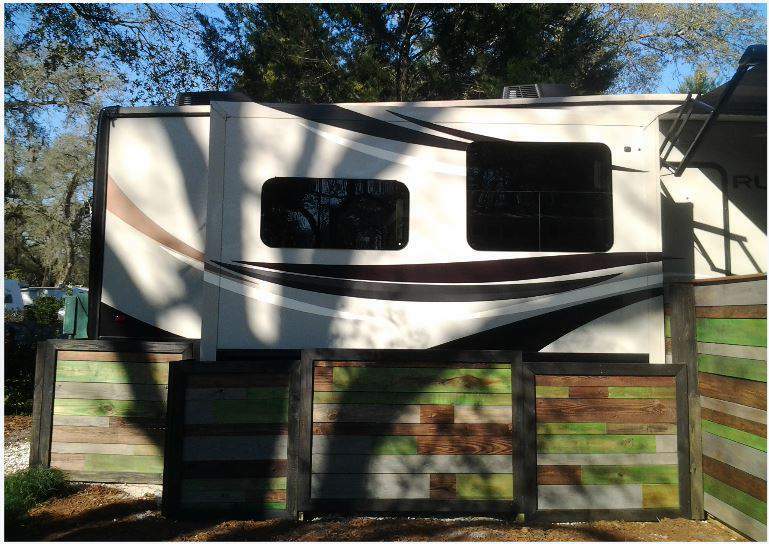 Richard’s new fifth wheel is set up in the popular Sawmill Camping Resort in Dade City, Florida for weekend getaways. The campground, like many across the country, is fairly strict and has a board of directors that must approve all RV modifications. Richard’s favorite style is modern and warm. 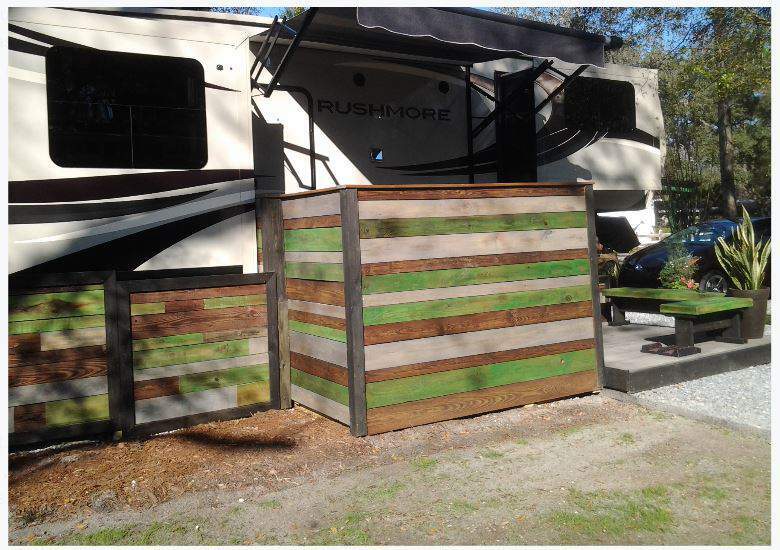 He wanted a custom RV deck design that had a modern design with high usability. He found a contractor that turned his vision into reality with a few specifications: the design had to meet the board’s approval and be transportable. The deck needed to slide out and be stored easily while on the road. The deck’s skirting panels are lightweight and easy to move when necessary. The hidden staircase creates a ‘soft entry’ and the platform has benches that create a welcoming area to take your shoes off or have an afternoon drink. The multi-color design is a perfect representation of the ‘California Modern’ style. Richard admits he was a bit hesitant when his contractor showed up with four cans of stain color: green tea, ebony, mahogany, and dove gray. He states, “Never in a million years would l think all those colors would work together!” Luckily, Richard went with the design and the results are incredible. The front and side skirting below the outdoor storage areas are slotted and lift out easily. Dorothy Ainsworth purchased her camper for $2500 and set it up on her property. Next, she built a portable deck that can be removed easily whenever she wants to take the camper on the road. 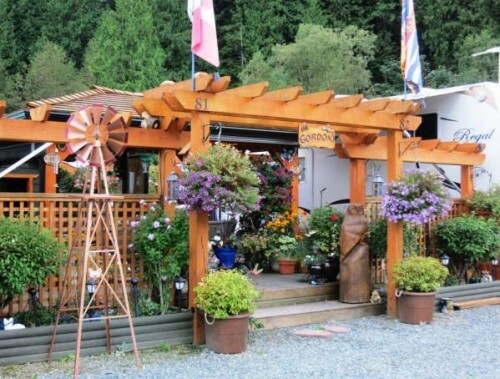 Dorothy does a magnificent job of journaling her RV deck design and building process on her blog. 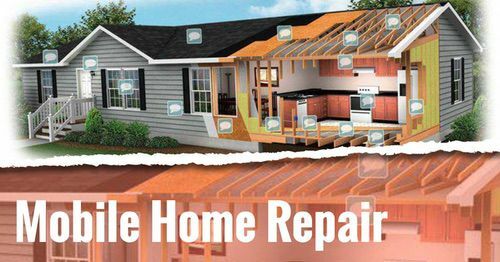 In addition, it is a great resource for anyone that is interested in self-reliance, affordable home building, and property development. Visit her at dorothyainsworth.com. 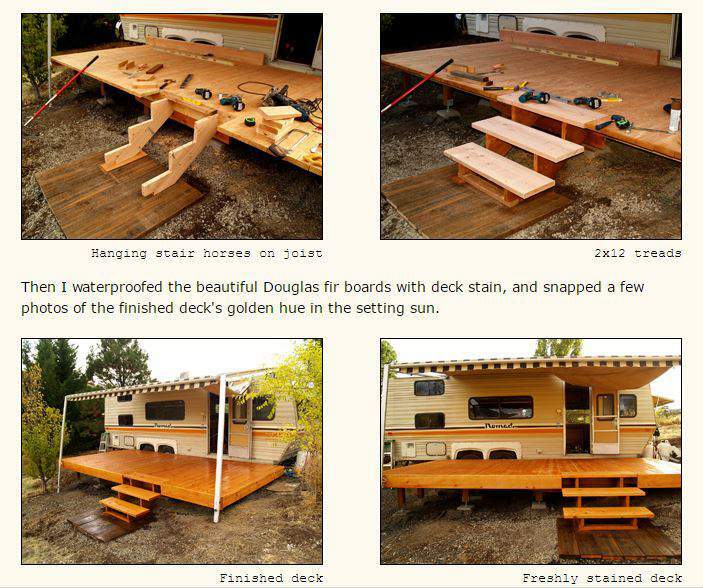 Below are a few photos chronicling Dorothy’s RV deck build. She began the build by having the property graded before the camper was placed. The next step was to lay concrete deck blocks and piers. Learn more about post and beam foundations and concrete block piers here. For portable, floating decks and sheds it isn’t always necessary to have footings poured below the frost line. Deck blocks are a fairly new product that allows for quick and easy deck foundations. They are best suited for ground-level or low-level decks that will be no more than 3 foot off the ground (you can use them for higher builds if the blocks are installed with in-ground footers). 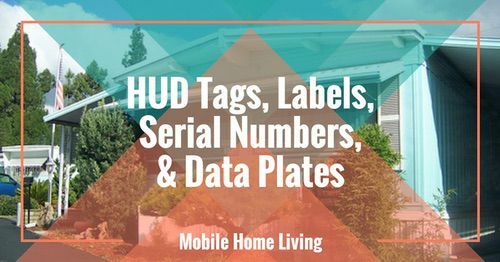 Learn more about concrete deck blocks and floating decks on Home Depot’s Blog. Dorothy set 20 concrete blocks into the hard-packed soil beneath the gravel. Once the concrete blocks were laid, the 4X4 piers were set into the block brackets at the appropriate height. These concrete blocks are very convenient; they can be placed just about anywhere and manipulated to get the needed height. Dorothy ran 16′ long, 2×6 joists along each side of the 4×4 posts in each row and attached them by screws. The Douglas Fir decking boards were then laid over the joists, steps were built, and the completed deck was stained. Choosing which type of lumber you use on your deck is as important as the design. You’ll need to take several things into account: weight, durability, insect and waterproofing, staining ease, and longevity. Learn more about comparing deck wood here. The end result was a low profile, floating deck that looks great in front of the camper. 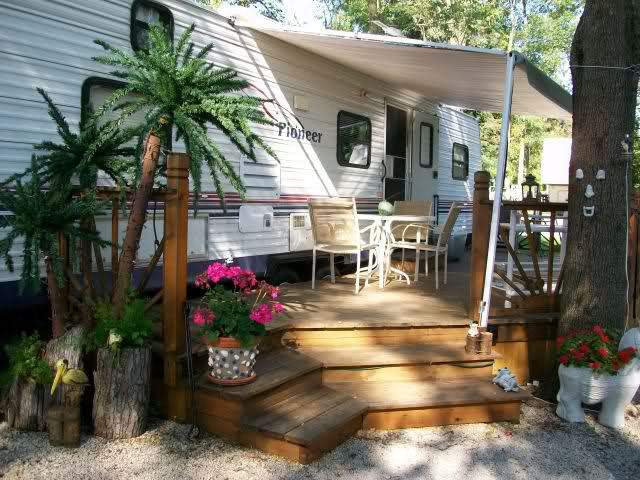 Permanent, or long-term, RV setups are most used for full time living situations and vacation homes. These installations are most popular near high traffic vacation spots such as lakes, rivers, and beaches. The Japanese style pergola above is an amazing addition to the RV. It creates a perfect area for container gardening as well as a covered outdoor living space. The RV deck design above creates a perfect outdoor dining space for this modern fifth wheel. Rain won’t stop this family’s enjoyment. What an amazing deck! This next deck and railing is a beautiful addition to a 30 foot recreational vehicle. 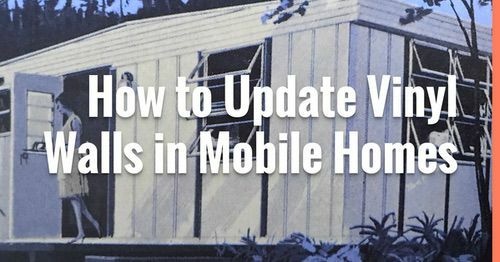 These longer RV’s are typically used for permanent vacation housing as they are more difficult to move. 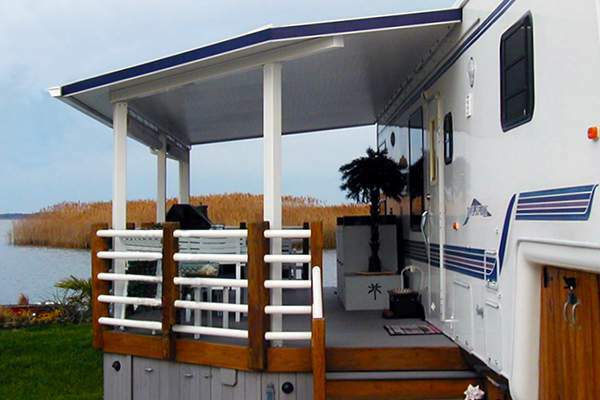 This RV is used as a summer home and takes advantage of its Indiana location with a retractable awning, perfect for optimal sun and shade. See more of this great camper here. 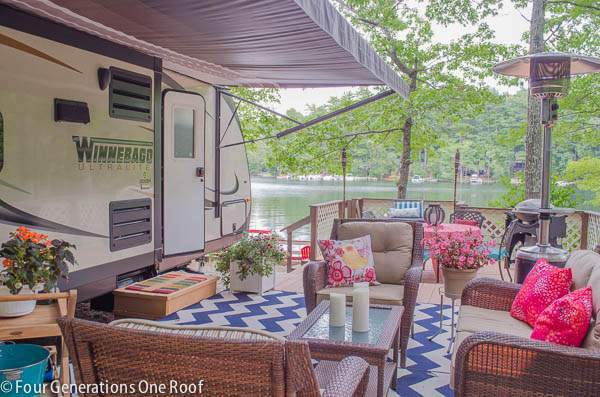 Jessica, the talented creator of the popular blog Four Generations One Roof, has a beautiful RV setup and deck design. 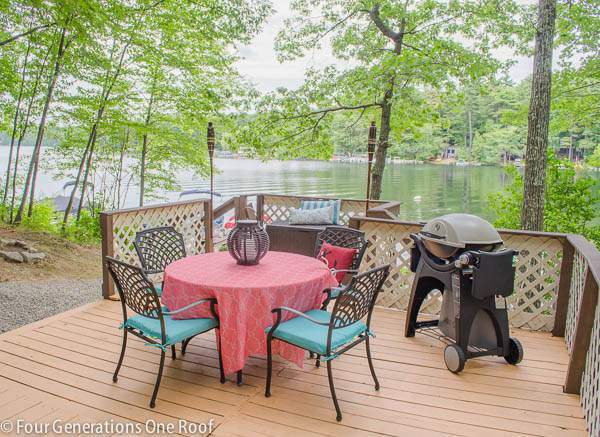 There are two driveways and two decks that total over 400 square foot. Jessica said the decks were over 20 years old and had never been stained or sealed. You can see the entire before photos and learn more about this RV deck makeover here. It’s amazing! 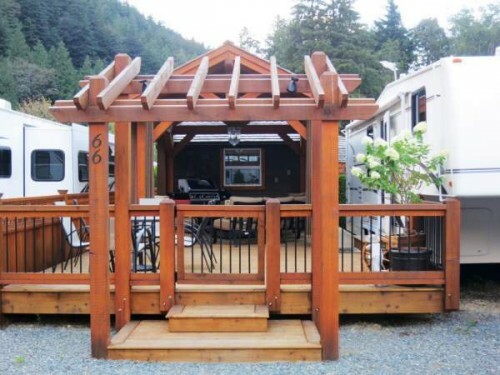 Do you have a great RV deck design? We’d love to see it! Really like the deck you built!!! Any other pointers for a newbie? Great post Crystal, Really appreciable, I never thought about it.